By transforming a classic critical edition into a student-driven digital assignment, students begin learning digital humanities practices early on, while also meeting the goals of a first-year writing curriculum. The pedagogical turn to the digital humanities offers opportunities for advanced students to direct independent learning in the humanities tradition while incorporating computer programming and online media. In the first year, however, students often lack the analytical skills and the technical literacy to make digital humanities a productive enterprise. Further, while many digital humanities projects are primarily led by small group practice or are independently computational, first-year students often require more guidance from instructors before they are ready to embark on collaborative or self-directed learning experiences. Here I present an assignment I designed for the first-year composition classroom that facilitates interaction among students and teaches critical thinking through the intersection of text and digital technology. This assignment demonstrates how students can use Google Docs to produce digital critical editions of modernist short stories, which meets first-year learning goals (such as developing critical reading, writing, and oral communication skills, considering other points of view, and integrating outside sources) and provides a foundation in digital humanities. Stories by Katherine Mansfield and from James Joyce work well for this project because the stories are relatively short but dense, there is a wealth of print and digital scholarship on them, and they were written early in the twentieth century, so historical sources are plentiful but not overwhelming. I use this assignment at the beginning of the second semester in a first-year composition sequence and it would work well as an end-of-first-semester assignment. The assignment begins with an in-class close-reading practice. First, the class chooses one story for discussion, which I import into a Google Doc and project via our classroom Smartboard. Then, students summarize the narrative. Because of the complex language and historical specificity of the stories, students tend to disagree on the characters’ motivations and development, and sometimes even on the essential events themselves. I use these disagreements to encourage students to seek the answers in the texts through a more nuanced interpretation of the language. Students work in small groups to close-read particular passages and present their changing ideas of the texts. While students are presenting their ideas, I add their interpretations to the Google Document via the “comments” feature. At this point, students can access the document and easily view the comments on most digital devices (laptops, tablets, and mobile phones). To ensure accessibility, I also ask for student volunteers to bring their laptops to class and I reserve three or four laptops from the library so all students can see the work and participate. Since students work together, one laptop or tablet for a group of four is sufficient. Groups then trade passages through the Google document so they can comment, add or disagree with the other groups’ interpretations. Finally, each group discusses their findings with the class. Screenshot of Google Doc with short story. 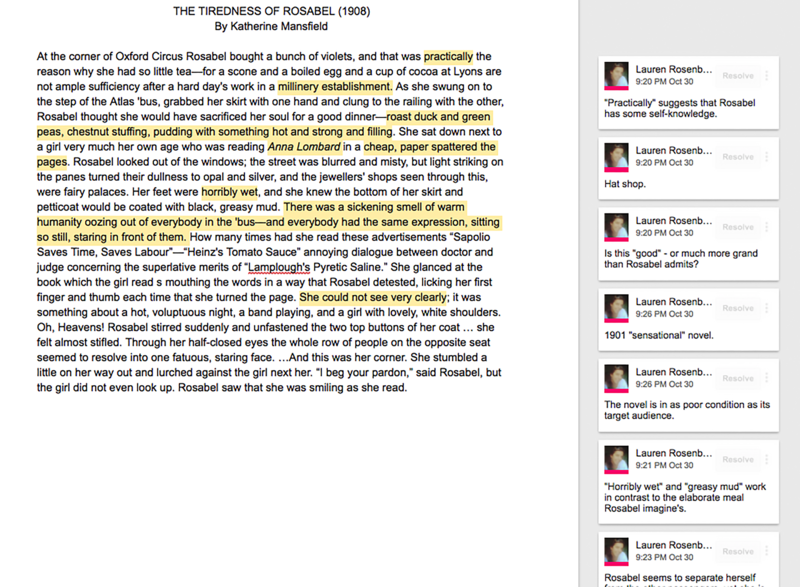 The instructor used the comment feature to highlight students’ interpretations in the paragraph-long passage from Katherine Mansfield’s short story “The Tiredness of Rosabel. Integrating a shared document in these early stages of close reading helps students directly connect technology to literary study. Many students, initially confused by the stories, have already searched for summaries on the Internet. I ask them to be upfront about this practice and add these references to the shared document. Then, I encourage them to consider how they can improve or add to the resources they found on the Internet by investigating the specific historical references of the story. At this point, students are ready to work independently. Individually they create unique copies of the shared document so they can develop their own critical edition based on the assignment. On their own, students select historical references to investigate further. From this research, they individually insert period photographs, maps, links to definitions of archaic language, and information about social, cultural, and historical references. They continue to share their documents so they can easily comment on one another’s progress, if they wish. 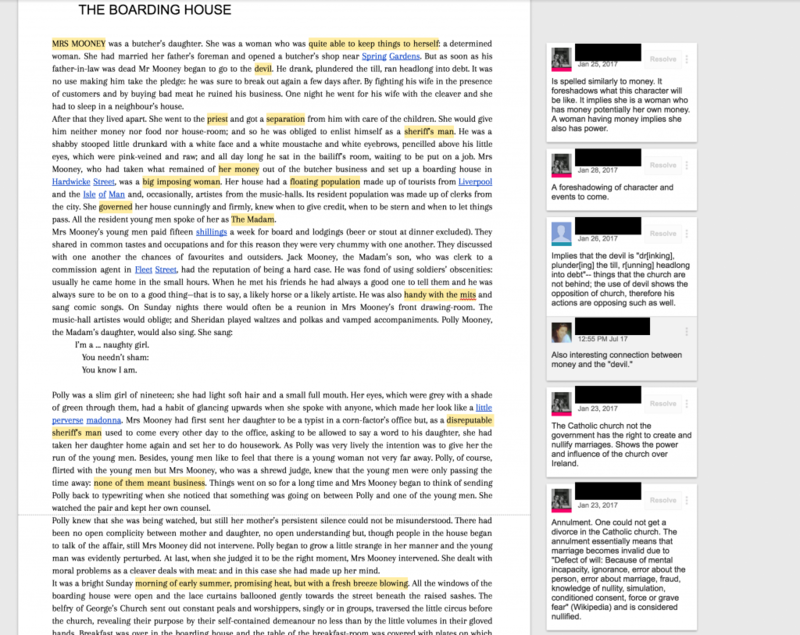 Screenshot of a short story pasted into a Google Doc with students using the commenting section to add links to social, cultural and historical references. Their audience for these critical editions, I suggest to them, is their peers in other classes who are writing research papers on the stories; to meet the needs of this audience, their information has to be concise, accurate and well organized. I also introduce them to the standards of traditional research papers; they are required to locate, read and report on a recent scholarly article and include the report in their critical edition. Students then consult online resources to gather information on how scholars are using digital humanities to analyze the stories, such as the Mapping Dubliners Project. Students further utilize Voyant Tools and Google Ngram to analyze their selected stories from different perspectives. Voyant provides visuals for language patterns and repetitions in the stories. This prompts students to consider how syntax can alter their interpretation of the text. Google Ngram helps students understand the frequency of particular words in the historical period. They finish their project with a two to three-page reflection on how this research experience altered their interpretation of the stories. In this reflection, they are required to comment on all of the elements of their research. In many cases, students reveal that they initially felt critical of the characters, many of whom are poor and unable to find a means to escape their living situations. With more historical knowledge and their own in-depth critique, students find they are more sympathetic to the characters’ representations of Joycean paralysis or the complexities of gender that Mansfield highlights. The Voyant Tools word map also made me think of the text in a new way. The words that are used most frequently in the text as a whole are: used, home, father. Used is a word that I did not expect to appear as one of the words that was used often– while home and father both seemed to make sense. However, looking at the text again and using “command f” to search the word used it makes sense. Eveline does a lot of musing on how things used to be and claims that “Everything changes”– which is the truth. At the same time, Eveline saying everything changes is so ironic to think about since she doesn’t necessarily make any concrete changes in her life and in regards to paralysis that is also a huge part of the text. Other keywords that I took care in noting were: hard, away, life, Frank, come, and remembered. These words continue with similar themes of how life during this time as a woman from a working class household in Dublin was hard and that Frank is an option for going away but Dublin is her home. She also is a very introspective character that thinks quite a bit about the past– getting lost in what used to be and the nostalgia for the past. When looking at the word map at first glance I thought “window” actually said widow. This had me thinking of the possibility of Eveline going to Buenos Ayres with Frank and something happening on the course of the trip or later after establishing her new life there that could result in Frank dying. Thinking of the story in such away also presents another risk– how would Eveline support herself in this new country alone? A sample critical edition can be found here, though the comments were removed to protect the student’s privacy. I designed this assignment with the goal of teaching students how to do their own research in the digitally-driven twenty-first century. In addition, because students generally spend more time gathering and reflecting on the material than they do writing a traditional paper, they benefit from the focus on process rather than product. They also gain a working knowledge of digital humanities applications and the relationship between digital humanities and textual analysis. Through this project, students engage in meaningful dialogues with each other, participate in a larger, scholarly dialogue about a specific text and contribute to the development of digital resources to assist future students. I keep a copy of the digital editions in Google Docs and share them with incoming students. I also encourage students to link to their digital editions from their own websites or transfer them to WordPress or similar platforms. With this assignment, I spend less time on close-reading than I do in conventional three-essay composition classes. However, students are increasingly doing online research before the first class meeting, which can complicate close-reading practices; in response, this project creates a productive, organized space for collective research. In the future, I will provide students with prompts related to the stories to help direct their research to more precise and nuanced textual interpretations. Lauren Rosenblum is a full-time lecturer at Adelphi University where she teaches and mentors in the General Studies Learning Community, an intensive liberal arts program for first-year students. She designs curriculum in a range of mediums and environments that yields productive learning outcomes for underserved students. Rosenblum’s research investigates the intersections between feminism, modernism and pedagogy.